The president said that despite their differences, he respects the Arizona Republican's service to the country. Following blistering criticism from lawmakers in both parties and veterans groups, President Donald Trump announced Monday he had signed a formal proclamation that would give Sen. John McCain his full honors. In a statement, Trump said he'd signed the proclamation keeping the White House flag at half-staff through the Arizona Republican's interment, scheduled for Sunday. He added that he'd asked Vice President Mike Pence to offer an address at a Friday ceremony at the U.S. Capitol honoring McCain and that he'd authorized, "at the request of the McCain family," military transportation of the late senator's remains from Arizona to Washington, military pallbearers and a horse and caisson transport during the service at the U.S. Naval Academy. Speaking to reporters later Monday at a White House dinner with evangelical leaders, Trump continue to praise McCain. "Our heart and prayers are going to the family of Sen. John McCain...and we very much appreciate everything Sen. McCain has done for our country," the president said. Trump's decision to issue a proclamation came less than a day after the White House had re-raised its flag Monday morning, following McCain's death on Saturday, and just hours after veterans groups and lawmakers from both parties, furious over the administration's decision to prematurely re-raise the flag, demanded it be flown at half-staff for a longer period of time. It also came less than three hours after a farewell statement from McCain — written before he died — was read publicly by a close friend of the senator, in which the Arizona Republican seemed to criticize Trump for fanning the flames of "tribal rivalries" and hiding "behind walls." Earlier Monday, Trump — who had feuded with McCain, saying he was "not a war hero" in 2015 — ignored repeated questions from reporters inside the Oval Office regarding whether he had "any thoughts on the legacy of John McCain." Moments before Trump's statement about the proclamation, the White House flag was spotted back at half-staff. 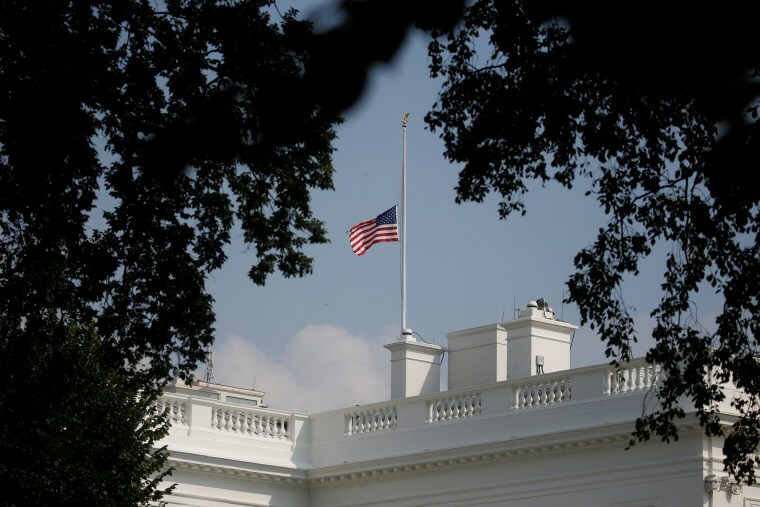 The White House had lowered the flag Saturday night after McCain died, and kept it lowered on Sunday, only to raise it to full staff by Monday morning. That decision prompted Senate Majority Leader Mitch McConnell, R-Ky., and Senate Minority Leader Chuck Schumer, D-N.Y., to write a letter in which said they wanted flags on all government buildings to be at half staff until McCain's funeral and asked the Department of Defense of help in doing so, Schumer's spokesman tweeted. A Defense Department official told NBC News that the agency had received the letter. The leader of the American Legion, a prominent veterans group, had also penned a letter to Trump urging him to lower the White House flag to half-staff through McCain's interment. "On the behalf of The American Legion's two million wartime veterans, I strongly urge you to make an appropriate presidential proclamation noting Senator McCain’s death and legacy of service to our nation, and that our nation’s flag be half-staffed" through his interment, Denise Rohan, the group's national commander, wrote. Veterans of Foreign Wars, as well as AMVETS, also criticized Trump for his response to McCain's death and called on Trump to keep the White House flag lowered for longer. Past presidents kept the White House flags lowered for longer periods to honor the passing of other sitting senators, and issued presidential proclamations calling for flags to remain at half-staff from the date of death until burial in honor of U.S. senators who die in office. For example, after the death of Sen. Ted Kennedy, D-Mass., on Aug. 25, 2009, President Barack Obama issued a proclamation ordering flags be flown at half-staff for four full days. Obama said in the proclamation that the "flag of the United States shall be flown at half-staff until sunset on the day of his interment." Obama issued a similarly worded proclamation on Dec. 18, 2012, one day after the death of Sen. Daniel Inouye, D-Hawaii, calling for the American flag at the White House and at public buildings and military posts to be flown at half-staff "until sunset on the day of his interment." According to the U.S. Department of Veterans Affairs, the "flag is to be flown at half-staff at all federal buildings, grounds and naval vessels in the Washington, D.C., area on the day and day after the death of a United States senator, representative, territorial delegate, or the resident commissioner from the Commonwealth of Puerto Rico." On Monday, the Pentagon, like the White House, had also raised its flags back to full-staff. According to Department Defense guidelines, a member of Congress only receives a flag lowering for flags at Department of Defense buildings, grounds and naval vessels around the world on the day of his death and through the following day. An extension of that rule for government buildings can only come from the White House.